From the very first lecture, he aims the philosophical problem of meaning squarely at the student, inviting us to actively engage with it-to take it personally. He does this, first, by asking you to grapple with questions that are truly universal, such as "How should I live my life?" and "What is the relationship of death to life? Is there some deep, sustainable connection between the two?" He also asks you to consider the direct, experiential evidence for both the notion of meaning itself and the perception of meaninglessness and absurdity. Throughout Philosophy, Religion, and the Meaning of Life, the unfolding drama of the Hero and Saint serves to focus Professor Ambrosio's larger, extraordinary purpose-to bring you face to face with the power of the question of meaning-both in humanity's past and in the present, living moment. Using the gripping story of two human archetypes, Professor Ambrosio offers you a concrete and practical context in which to pursue your own search for meaning-a way of looking that allows you to determine your own path, while palpably sensing your intimate, personal connection with history; a way of questioning that makes philosophy itself a real and immediate way to address your most essential concerns. 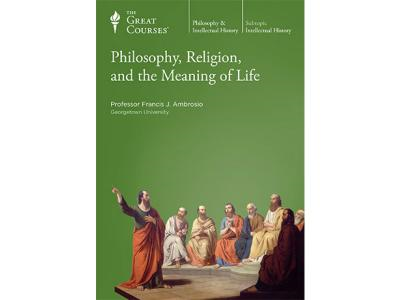 Join a masterful teacher in this engaging study of Philosophy, Religion, and the Meaning of Life-an intellectual adventure that speaks deeply to an inspiring, creative dimension in living.